Welcome to my website! I am so glad to have you here. Whether you are a parent, therapist, professional, graduate student or just surfing the web, I believe you will find useful articles, ideas, and techniques to use at home and in the play room. Let me tell you a little about myself. I am, first and foremost a mother, a wife, a sister, and a friend. I have three rambunctious kids who I like to refer to as “my insanity makers and my sanity savers”. I am married to a wonderful man who is my best friend and partner in all that I do. I also happen to be a child therapist who specializes in play therapy. I have been doing this now for over a decade and plan to continue to pursue my passion of working with and helping children and families heal from abuse and trauma for many years to come. I have been very fortunate in my career to be able to work as a clinician, and speak at many different venues including radio, TV, and other media. I also regularly present at workshops and professional conferences locally, nationally, and internationally. For further information on future speaking engagements click here. I would also love to present at your mental health conventions, workshops, and local or state play therapy conferences as well. To book a presentation click here. Throughout my many years as a clinician, the most rewarding experience is witnessing a child who has been through trauma and hurt, genuinely laugh again and find their inner voice through the process of healing. This is my passion and my desire for each of my clients I work with. I invite you to stay connected through workshops, events, and on my website. I also welcome you to follow me on Facebook, LinkedIn, Pinterest, Youtube, and Twitter! 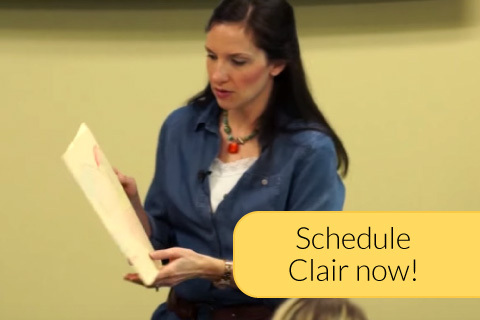 Clair Mellenthin, LCSW, holds a Master’s Degree in Social Work from the University of Southern California. Throughout her career, she has focused on providing therapy to children, teens, and their families. Before joining Wasatch Family Therapy as the Director of Child and Adolescent Services, she worked in a successful private practice. She is currently the Clinical Director at Wasatch Family Therapy. Ms. Mellenthin is a sought after supervisor, training graduate students and interns in play therapy, and an adjunct faculty member at the University of Utah, Utah Valley University, and the University of Southern California MSW programs. She is currently the President of the Utah Association For Play Therapy. In addition to being an experienced play therapist and professor, Ms. Mellenthin frequently presents professional play therapy and family therapy trainings and appears on local and national TV and radio as an expert on children and family issues.